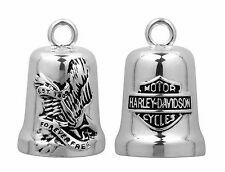 Harley-Davidson® Freedom Eagle with Bar & Shield® Ride Bell - HRB010 HRB010 The Harley-Davidson® Freedom Eagle with Bar & Shield® displays the Freedom Eagle on one side, reversing to the Bar & Shield® logo on the other. 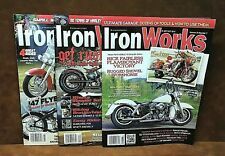 (3) 2012/2013 IRON WORKS MOTORCYCLE MAGAZINES. ~ WE HAVE LISTED HUNDREDS OF MOTORCYCLE MAGAZINES ~. ~ SEPTEMBER/OCTOBER 2012 ~ DECEMBER 2012 ~ JULY 2013 ~. Harley-Davidson Bar & Shield decal. Large size. Size: 7.5" x 6". Harley-Davidson Bar & Shield Decal. Large Size. New Arrivals. We do not accept P.O. Boxes.